William Blake was born on November 28th, 1757, at 28 Broad Street, Carnaby Market, Golden Square. To-day a large house stands in Broad Street numbered 28, to which is attached a blue disk announcing that William Blake, Poet and Artist, was born there. The house looks old and shabby, and may well have stood a hundred years; but on inquiry one finds that it is a recent erection, and that of Blake’s actual house not one stone has been left upon another. One walks through Broad Street and its neighbouring streets hoping to see at least one group of buildings as Blake saw them. But all has changed, and except for a block of houses on one side of Golden Square, there is nothing to remind one of the sharp transitions that a few years can effect. Even the sounds have changed. From the doors and windows of Number 28 is heard day and night the whir of machinery ceaselessly at work to supply the inhabitants of Pall Mall and St James’s with electric light. Carnaby Market has vanished, and its glowing colours have reappeared in Berwick Street, where fruits are displayed on public stalls, and where from time to time titled ladies are known to explore in search of a pair of boots, or some other indispensable article of clothing. Great ugly buildings—a brewery, an infirmary given up during the war to Belgian refugees, warehouses—afflict the eye at every turn; and through the open windows of the upper stories the social regenerator may detect the countless bent backs and expert fingers of tailor hands turning out perfect equipments for noblemen all over the country who come to Regent Street, Maddox Street, and Conduit Street to be measured and fitted and tried. In Blake’s day the transitions in Broad Street were more clearly defined. It had been a fashionable quarter, and still retained a vivid memory of its past glory. The new buildings were shops of a good solid kind, which struck the eye like vivid green paint as they sprang up side by side with the older private houses that time had softened and mellowed. Blake’s father was a hosier. His name was James, he was married to Catherine, and they had five children, William being the second. James was a dissenter, but, like so many dissenters, he liked such important functions as baptism, marriage, and burial to be performed by the Church of England, that there might be no mistake about them. Accordingly, William was taken on December 11th, when he was a fortnight old, to be christened at St James’s Church in a Grinling Gibbons font, the highly ornate character of which was fortunately not observed by the tender recipient of baptismal grace. William was a solitary, imaginative boy. His imagination was first stimulated and nourished by town. His father’s home, in sharp contrast with the older houses in the neighbourhood, made him perceive that there was a meaning Past as well as a so-far unmeaning Present: and the moment his imagination escaped into the past it tended to abstraction, but knew no bounds. Very soon in his solitary walks he found his way into the country, emerging from London on the south side and exploring as far as Peckham Rye, Dulwich, Streatham, and Sydenham. His first glimpse of the country was to him as our first trip abroad to us. The trees, the hills, the grass and the cattle spoke obliquely to an imagination that already had a bias. He loved them—with discretion. To him London was older than the country. Nature has a way of disguising her great age in an ever renewed youthful present. London’s present drives one to the past. Nature bewitches her children and will not allow them to transcend her. A great city with its pulsing life carries the exuberant spirit in its mighty rhythm, and yet drives it back to the ancient primeval sources concealed in the eternal kingdom of the imagination. Wordsworth, Nature’s lover, soothes and lulls our restlessness and pain, but fails to carry us into the promised land. 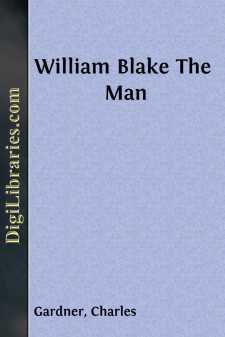 Blake, the inspired citizen, pierces with his sword through Nature, and will not rest until in England’s green and pleasant land he has built Jerusalem, wherein we may feast as comrades and be satisfied with the wine of eternity.